This Califone 24-Pack of Disposable Cloth Earpad Covers contains 12 pairs of black earpad covers designed to be used with all headphones of the Califone 2924 series, the 3068AV and SA-740 headphones, the wireless series of CLS headphones, and the Sound Alert headphones. They can also be used on the 3066AV and 3066-USB headsets. The Califone earpad covers are made of 100% polyester fiber, which makes them hypoallergenic and disposable. They fully enclose the ear cushions of the headphone, helping to keep the headphone clean and improve hygiene. The earpad covers also help deflect perspiration in hot, humid conditions and will not affect the overall sound quality. 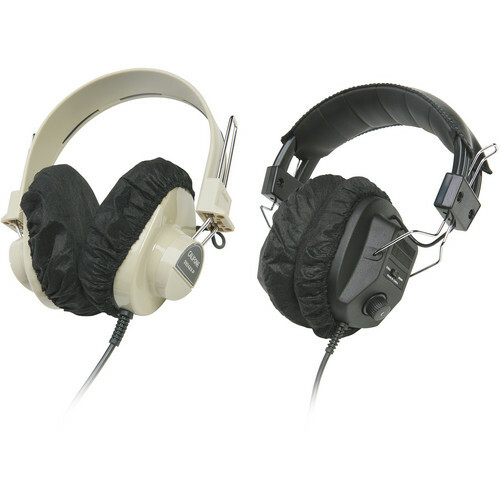 Designed to provide comfort by avoiding direct contact with the vinyl ear cushions, the disposable cloth earpad covers are especially suited for high-use school settings such as classroom listening centers, libraries, computer labs, and in ELL and ELD activities. Box Dimensions (LxWxH) 6.8 x 3.5 x 2.4"